1. A specific day in a week that is designated by some religions as being the day during which they worship God: Karin and her family observe the Sabbath on Saturday in accordance with the teachings of her religion. "The seventh day is the sabbath or the day of rest and worship of the Lord thy God." Except when directly quoting the Bible, in which Sabbath is spelled with a lower-case "s" (sabbath), it should be spelled with an upper-case "S" (Sabbath) in accordance with universal custom. The Sabbath falls on Sunday among all christian sects, except the Seventh-Day Adventists when it falls on Saturday as also with Jews, and on Friday among Muslims. 2. Etymology: from Hebrew shabbath, "rest", the seventh day of the week, appointed in the Ten Commandments as a day of rest and worship to be observed by the Jews ("Remember the sabbath day, to keep it holy"), which is now Saturday; therefore, in subsequent Christian usage, the "Lord's Day", as observed by Christians is on Sunday." "The same Hebrew word has provided us with sabbatical, referring to the seventh year during which ancient Jews were required to refrain from tilling the soil (working on their farms) in order to "rest"; from which we get our modern term sabbatical, a year's vacation awarded to teachers in some educational institutions every seventh year." A reference to a period during which someone does not work at his or her regular occupation: Marissa decided to take a sabbatical leave to do research in her teaching specialty. A special time during which a person does not work at his or her regular vocation and is able to travel, rest, do research, etc. : There are a few of the university professors who are currently taking a sabbatical and they will return to their normal teaching assignments next year. Marla recently returned to work after a one-year sabbatical from her singing career. 1. A bag made of any of a variety of materials, used for containing or carrying items: Rena asked the farmer if she could buy a sack of apples. 2. A specifically designed bag typically with shoulder straps used for carrying heavy items; such as, camping or hiking gear: Each scout had a hiker's sack to carry while they were going for a walk. Sacks were originally made of coarse cloth similar to those that were used in making "gunnysacks". The word sack came from Hebrew sag, "sack", "sackcloth". In the Bible, "sackcloth and ashes" refers to the wearing of rough sackcloth garments and sprinkling ashes on the heads by those who are showing that they are sorry for sins or wrong doing that they have done. 3. Etymology: from sachet which is French for "little bag"; specifically, "a small ornamented bag" for carrying perfumed powder or something of a similar nature." 1. To pack or to place something in a bag: Marven was hired one summer to sack grain at a farm. 2. To rob, to loot, or to pillage: The invaders sacked the village of anything of value. The expression to sack, meaning "to loot", comes from the use of sacks by looters as a convenient means of carrying away their stolen goods. 1. A tale, a legend, or a story that includes a long, often historical, narrative: The story tellers of many cultures tell sagas of heroic deeds by ancient warriors. 2. A written or verbal report that is long and contains detailed narratives: Bob detailed the saga of his family problems. A saga is a prose narrative that was written in Iceland between 1120 and 1400, dealing with the families that first settled in Iceland and their descendants, with the histories of the kings of Norway, and with the myths and legends of early Germanic gods and heroes. 3. A detailed narrative of events or personal experiences that have existed over a long time: Mike's sister is such a good storyteller that she can turn a simple walk to the grocery story into a saga. 4. Etymology: from Old Norse saga, "a story" cognate with Old English sagu, "a saying". 1. Scornful or cynically mocking: Shirley had a sardonic smile when she was told what a wonderful dress she was wearing. 2. 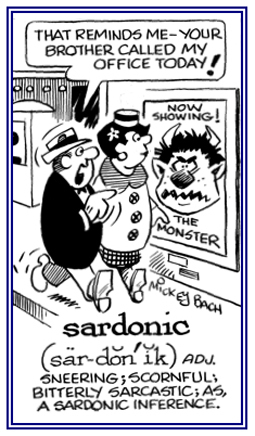 Etymology: from Greek: sardonios, "of bitter" or "scornful laughter". 1. Relating to the tailoring of clothing: In his flashy suit, Jack had by far the most sartorial outfit at Jane's birthday party. Sam's special suit was of sartorial interest to those who were at the nightclub. The couple arrived for their wedding ceremony in sartorial splendor. 2. 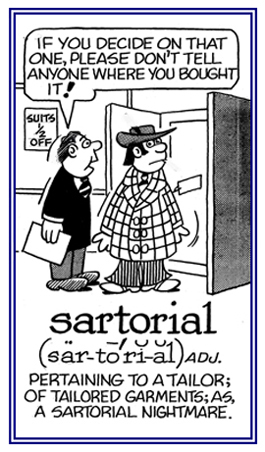 Etymology: from Latin sartor, "tailor"; from sarcire, "to patch." © ALL rights are reserved. 1. A common or old familiar proverb or saying: "A stitch in time saves nine" is one saw which means: A little effort done sooner to fix a small problem prevents it from becoming a bigger one requiring more effort to fix later. Frank's grandfather often recited the old saw about "An apple a day keeps the doctor away." "Fools rush in where angels fear to tread" is another saw which means "look before you leap" because when a person does not plan ahead and think matters through, he or she could become involved in risky or unfavorable situations which a wise person avoids. 2. 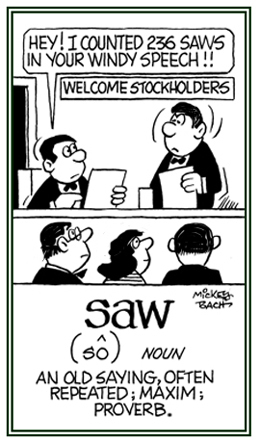 Etymology: from Middle English sawe and Old English sagu, "speech, talk." © ALL rights are reserved. 1. An unscrupulous business scheme for making money by dishonest means: The police were able to arrest the gang which was running a scam out of a basement. 2. A situation in which a person has been deprived of something by means of deceit; such as, a confidence game or other fraudulent scheme; especially, for making a quick profit; a swindle: Every day people read in the papers about those who have fallen prey to criminal scams because someone was trying to deceive them in order to get their money. 3. Etymology: from 1963, used as a noun or a verb; U.S. slang; said to be a carnival term, of unknown origin; however, it is obviously related to "fraud" in meaning. A person or those who swindle others by means of deception or fraud; sometimes as a result of "spamming" on the internet: Lenora made the mistake of responding to a message on the web and the scammer got a significant amount of money from her bank account. 1. A concerted effort to achieve a goal which relies on deceit to be successful: It appears that some candidates are running scampaigns to get nominated for or to win political offices. 2. 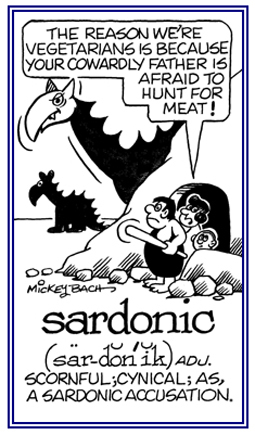 Etymology: a neologism that blends scam + campaign and apparently came from advertising businesses in order to fake advertising campaigns for nonexistent products that were submitted to "ad-of-the-year awards" and which can now be applied to political campaigns and other activities. 1. To be involved in an effort to achieve some objective by using deceitful procedures: There have been some people who were scampaigning to win political elections. 2. 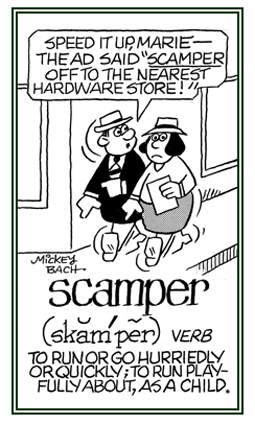 Etymology: a term that blends scam + campaign which has been coined to form a new word. To quickly move, often in a playful way: Patricia and her children were scampering around at the neighborhood playground. Mark was shocked to see a mouse scamper across his living room while he was watching TV. 1. 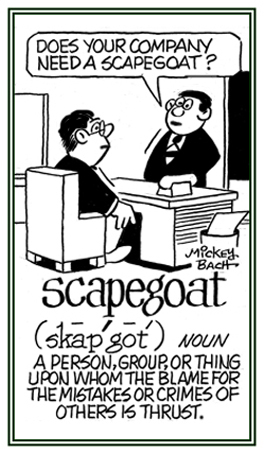 Someone who is unfairly blamed for the wrongdoings, mistakes, or faults of others: The company's chief executive was made the scapegoat for the decrease in sales and profits during the last six months. 2. Etymology: from Hebrew azazél, iterally the "goat that escapes." © ALL rights are reserved.